As I've said before, D&D means a thousand things to a thousand people. It's impossible to define with just the acronym alone. Even citing a particular version, preference, or play-style of D&D is fraught with peril. Getting on the same page with a virtual table full of players is of paramount importance. Without a place to start, you have nothing but floundering. You need some kind of foundation in order to begin playing. Here is bedrock! All new and over-the-top "bloodstained parchment" look provided by layout guru David Guyll. Did I mention it was absolutely FREE?!? There are a few iterations of Crimson Dragon Slayer out there, but this isn't a new edition. Rather, it's my quick and dirty checklist / cheat-sheet for running OSR type 5e games online. It started here and evolved organically thanks to the feedback I received. For me, virtual gaming requires the most rules-light approach. 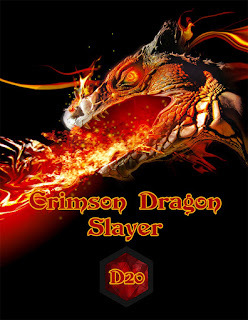 Crimson Dragon Slayer D20 is my solution to all the problems I've encountered running D&D on Roll20, Fantasy Grounds, and elsewhere. p.s. If you appreciate all the freebies that come out of Kort'thalis Publishing, try our nearly 50 PDFs!